Your home’s siding is a lot like its skin. The siding protects the structure of your home from moisture, helps hold conditioned air in and enhances the exterior look of your house. Siding is one of the most durable exterior finishes available. Quality siding like Hardie siding, can be warrantied for up to 50 years. Still, there comes a time when it’s recommended that you repair or replace your siding. Here are four signs to look out for. Dry rot occurs when fungi eat away at your wood siding. Fungi thrive in dark, damp areas so it most often imposes its damage starting from the underside of your siding, where you are least likely to notice it. Over time, the fungi cripples the integrity of the siding so much that your home becomes overly susceptible to other forms of damage, like water, wind, termites, etc. Tap on the siding in several areas. If you hear a hollow sound, you may have dry rot. If the siding feels rubbery when pushed, or gives way, that’s another sign of dry rot. Remember that your siding can have dry rot on the underside and still look presentable on the exterior, so regular tactile inspection is recommended. If you have dry rot and catch it early enough, you may only have to repair limited patches of siding instead of getting a residing job on your whole house. Excessive heating or cooling bills can be a sign that it’s time to replace your siding. There are many factors that contribute to a home’s insulation quality, and siding is one of them. If you have an older home and have never had siding replacement, chances are that your siding is not performing the way it should. Lots of progress has been made in siding materials and insulation qualities; particularly with Hardie siding brand. The first thing you should look to if your energy bills are through the roof is to have a siding installation company come out and inspect your siding. To an untrained eye, your older siding might appear to be fine. 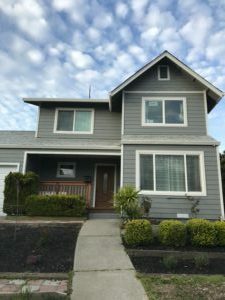 But a professional siding installer may be able to provide siding replacement estimates that will ultimately keep those energy bills in check for decades to come. Siding that’s in good condition doesn’t need to be painted once very two years. Newer quality siding such as Hardie siding is manufactured with UV protection built in. That UV protection helps keep the sun’s harmful rays from drying out the siding and causing it to age prematurely. If you find that repainting is needed more often, it’s recommended that you invest that money instead into siding replacement. As you can see, your home’s siding is much more than an aesthetic outer covering. It plays an important role in your home’s overall conditions. For more information or to get a free siding inspection, please contact us today.